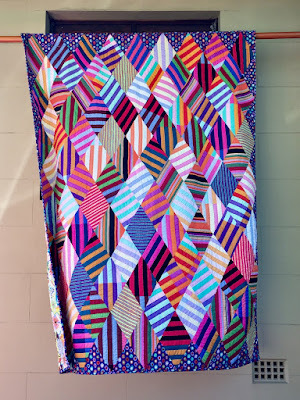 The first thing I saw as I pulled into the driveway at Material Obsession last Friday was Kathy Doughty's Marquee Diamonds quilt. The sun was making it glow while a breeze was making it dance. 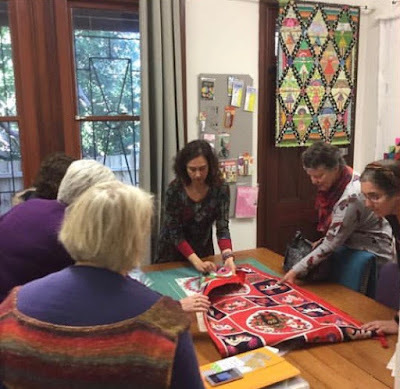 There are always welcoming quilts lining the way to the entrance. The quilts are different every time I visit. I always stop for a moment or two to admire the beautiful work. 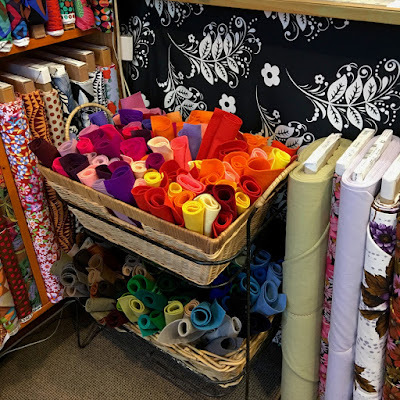 Inside the shop this rolled up felt looked like fabric fire!! What a great way to light up a corner. I'm trying to think of the right word to describe this wall of Kaffe Collective fabrics.. I think I'll make up a new word, how about... Scrumptuliscious!! On to our Whizz Bang! class. 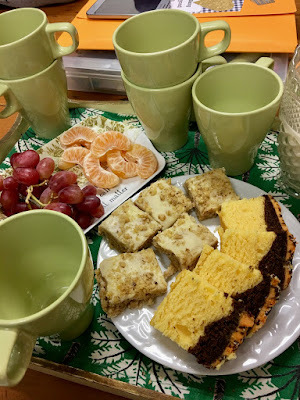 The class begins with morning tea while I talk about the technique of the day. 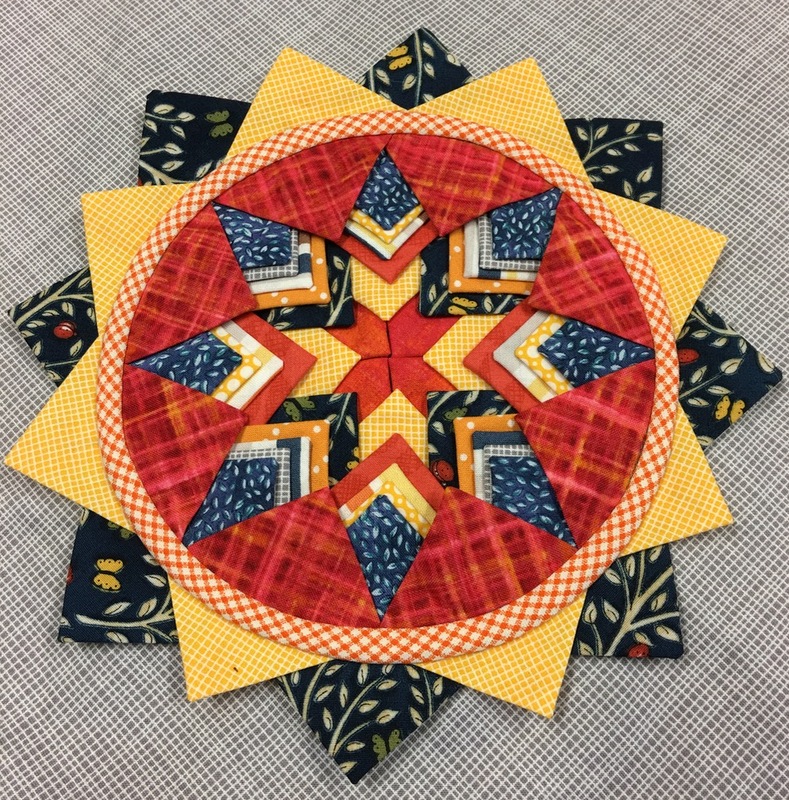 There was lots of show and tell of beautiful blocks. These are made by different people but they all look so good together. Here are some of the wonderful pieces made during the class. This block has such a lovely spring time look to it. 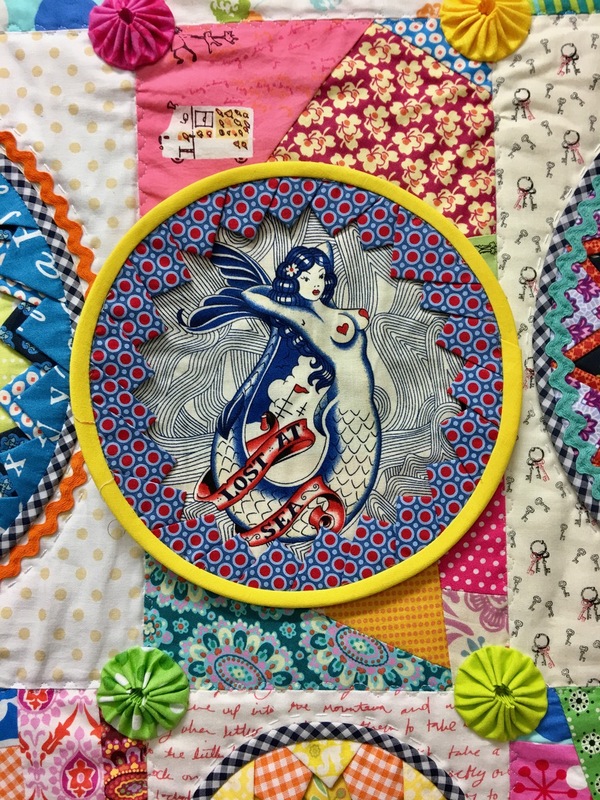 We all love this mermaid block so much!! 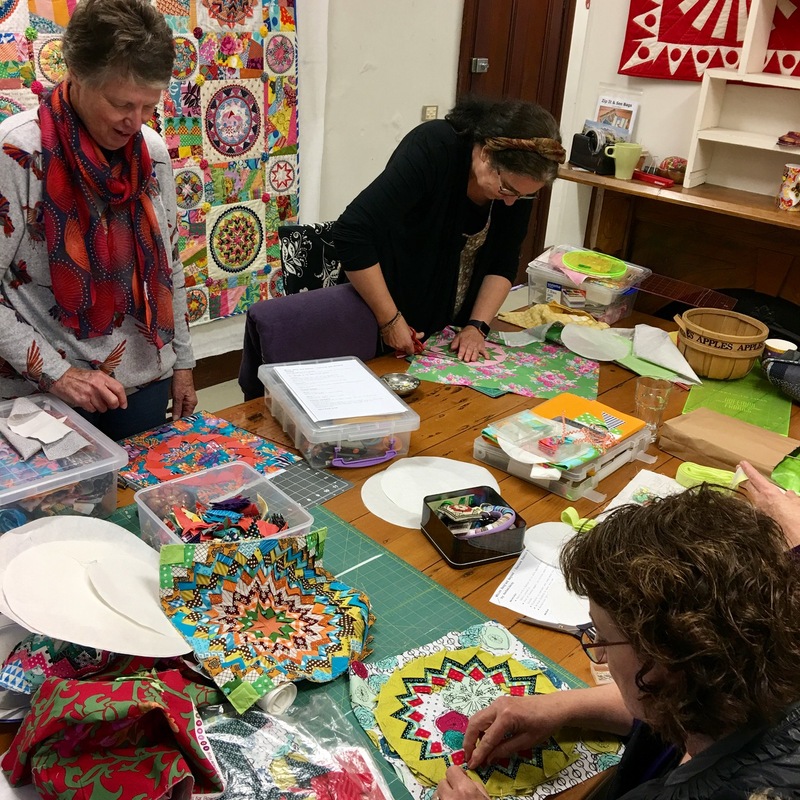 After the class I had the pleasure of chatting to Kathy as she prepared kits. A simple thing like cutting fabric can be wonderful to watch. 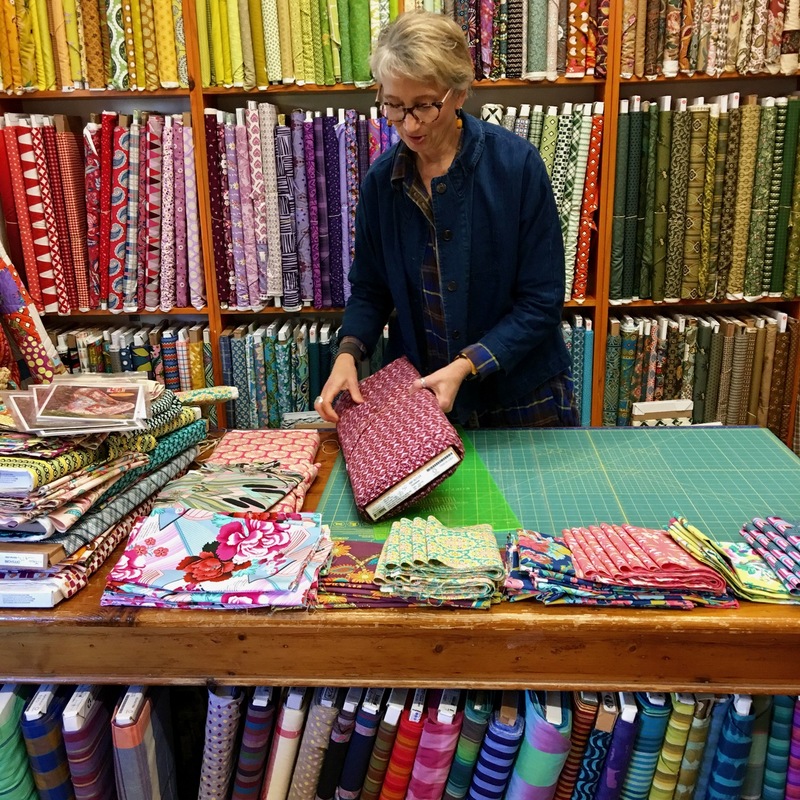 Seeing Kathy pick and choose and admire each pattern of the fabric as she unrolled the bolts. As for fabric love - this tiger leaped out of the shelves at me. It reminds me of the William Blake poem 'Tyger Tyger burning bright. In the Forests of the night'. 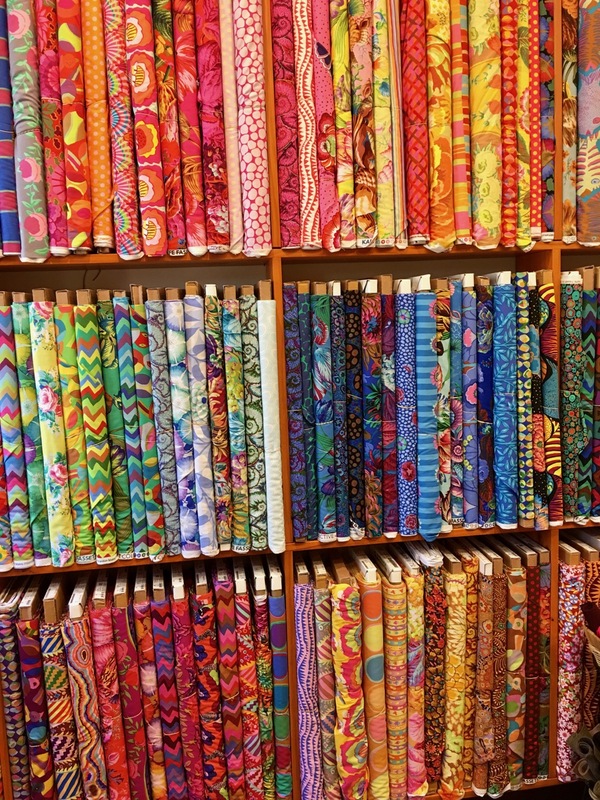 I figure if a fabric makes you think of poetry you know you should get some. 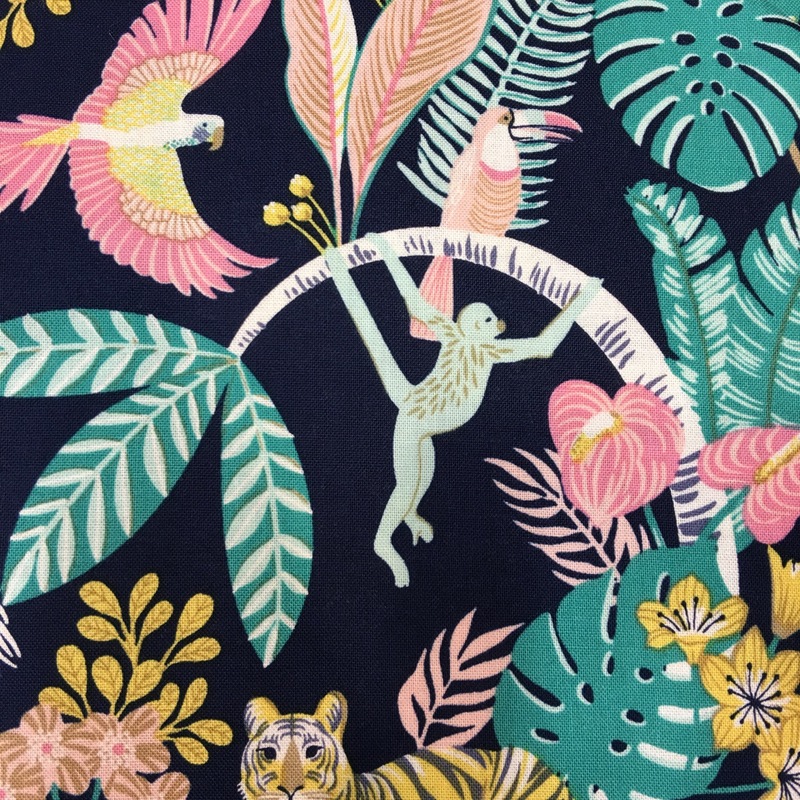 No doubt I'll be a happy monkey when I'm sewing with it. 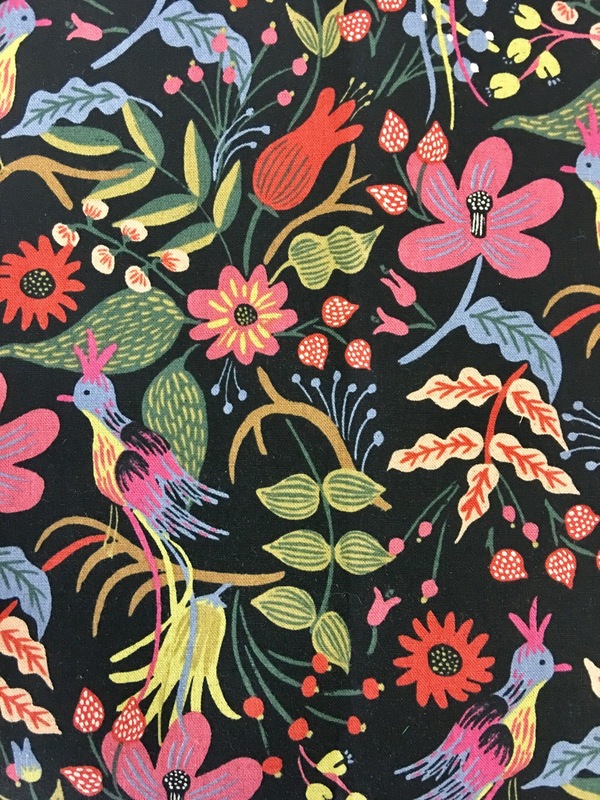 A piece of this fabric came home with me as well. I seem to be attracted to dark background fabrics at the moment. I like the way colour pops against the midnight colours. I had a special surprise waiting for me when I got home on Friday. A gorgeous babushka needle book made by my friend Janice and the gorgeous charm pin made by her sister Chris. 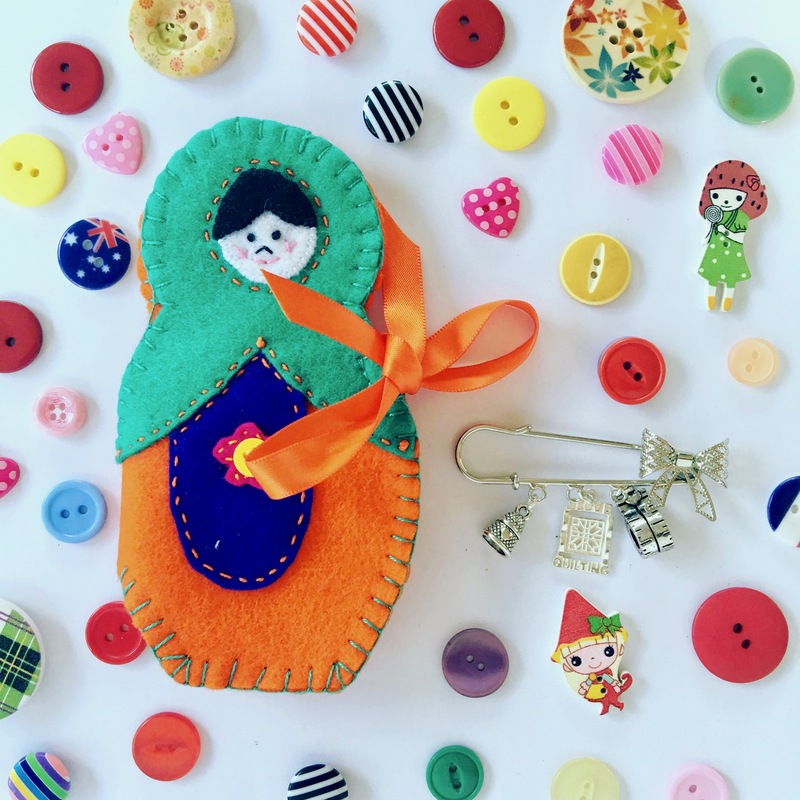 It's hard to see in this photo but the charms are a thimble, a tiny quilt and a tape measure. Janice obviously knows orange is my favourite colour. These were such special and thoughtful gifts. I know I say it all the time but quilters are the loveliest people!! Thank you Janice and Chris! 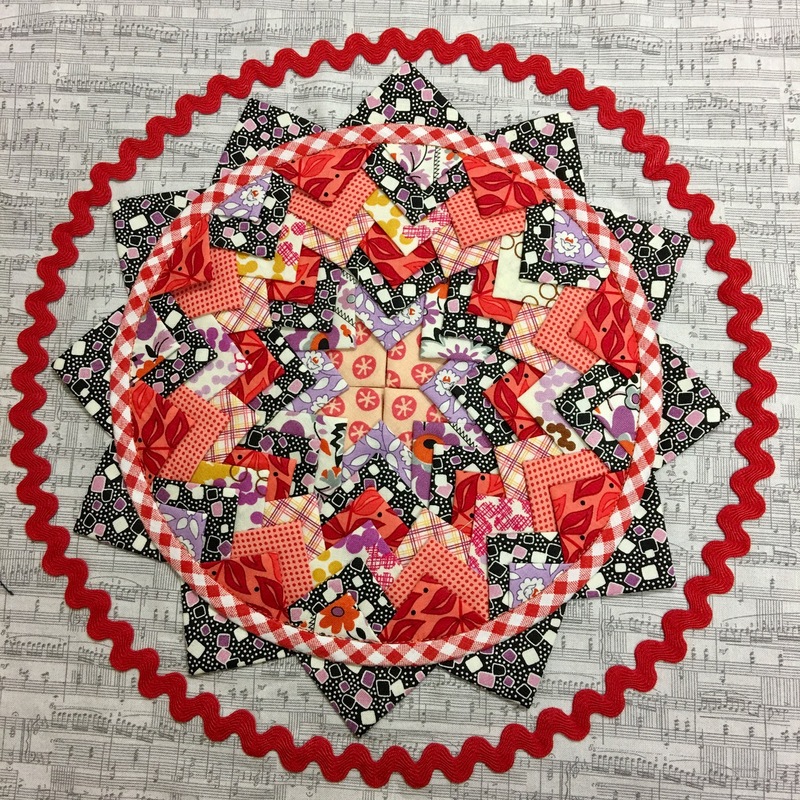 I haven't forgotten about the giveaway - Congratulations to Wendy of The Constant Quilter who won a copy of Quilters Companion magazine. The funniest thing happened when I went to email her to let her know she was the winner I saw I had an email from her. She was telling me I'd won a giveaway on her blog!! What are the chances of that happening? Just amazing!! 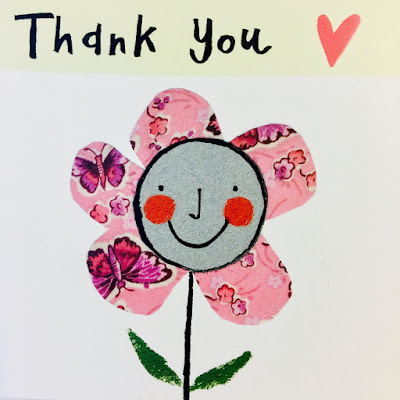 I want to send out a special Thank You to everyone who entered the giveaway and for your wonderful comments. I do appreciate each and every comment. 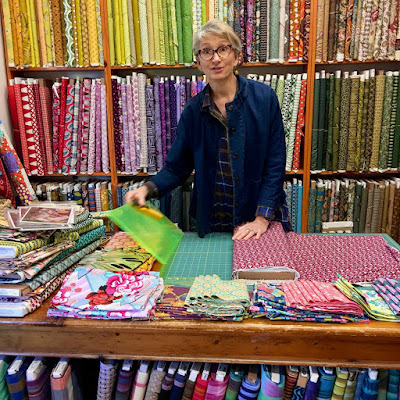 Knowing that people read my blog encourages me to keep writing my whimsical thoughts and reporting my sewing adventures. 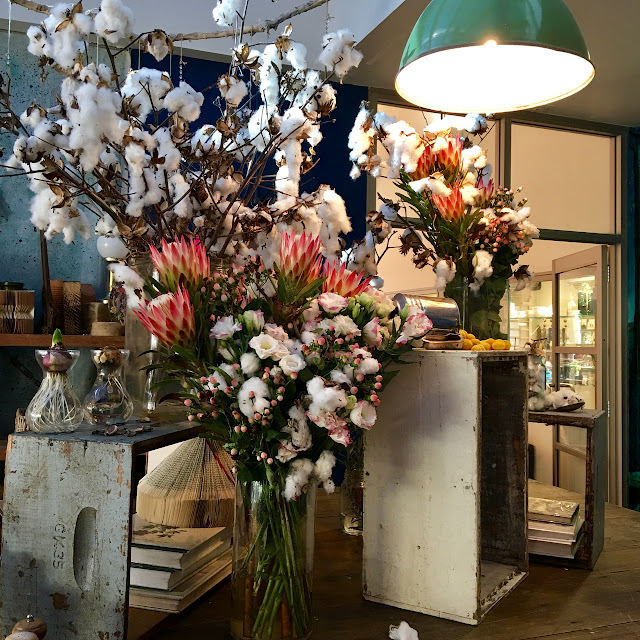 I was out and about today and saw this floral installation with cotton flowers. I've only seen these fluffy blooms a few times in my life so its always special when I do. It's fun to remember that it's these flowers that make the cotton we make quilts with. Wishing you a week full of flowers and fabric love. Enjoyed your story and picture! Thank you. Hope tot meet you one day. Oh another mouth=watering post! 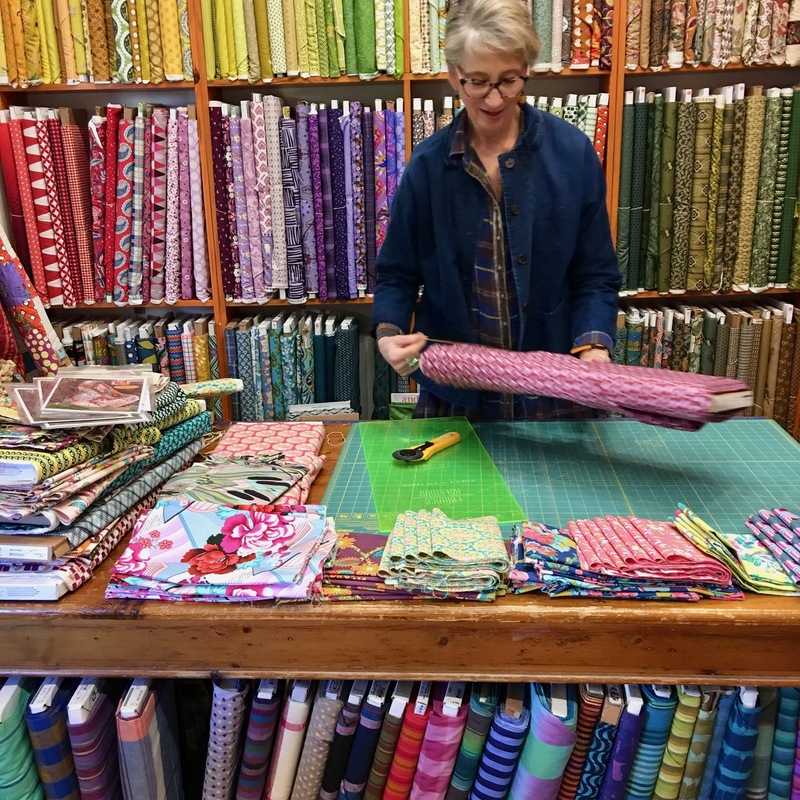 Looks like you all have lots of fun during your classes and it's great to see pics of Material Obsession, Kathy and the luscious fabrics. 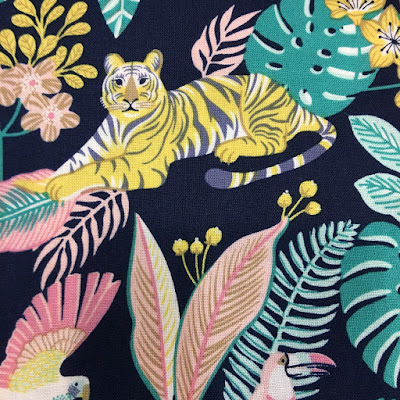 I love the tiger fabric you were lucky enough to take home with you. 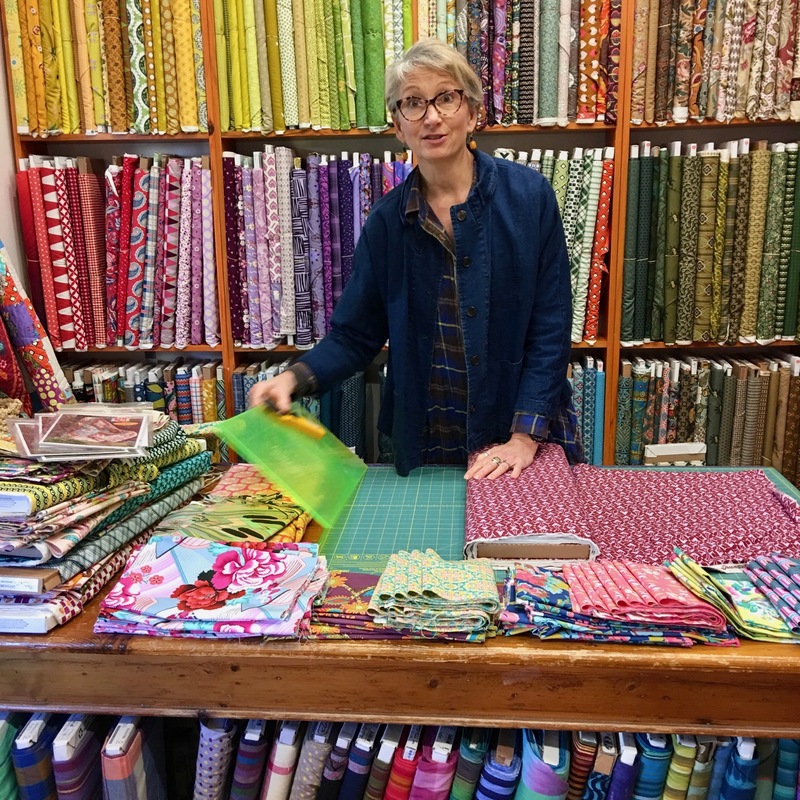 Oh, by the way picked up the Quilters Companion today - super story about you, so interesting. 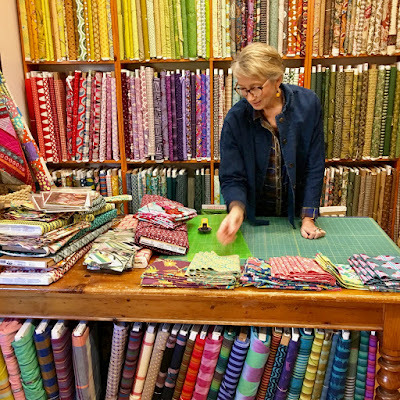 I'm not a modern quilter but I admit I really loooove those fabrics ! 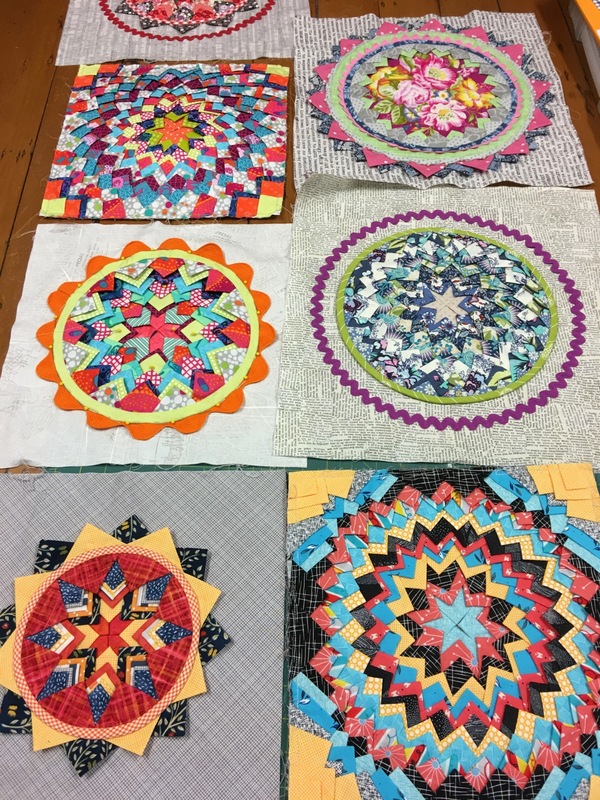 Beautiful blocks made by talented quilters ! And congratulations to Wendy ! I'm pretty sure she will dance around her table ah ah !! What a Beautiful projects,you are teaching well. Love your blog and showing all these colorful Fabrice Just dus dandy. 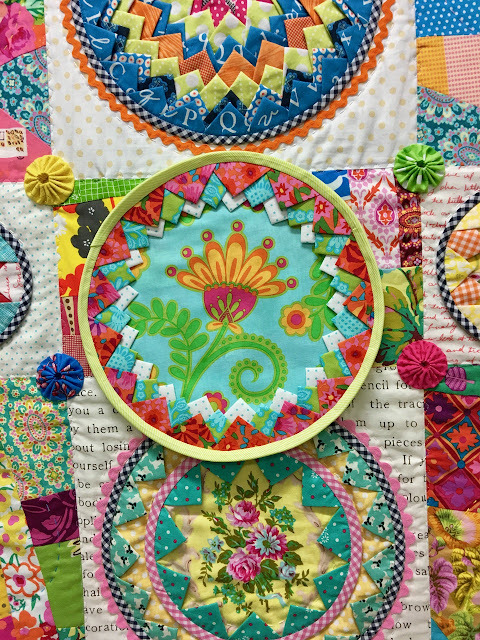 I really enjoy seeing what your clever students have been creating and Kathy certainly has a great eye for colour. Have fun with your new fabrics. The fabrics and blocks - all so fabulous! 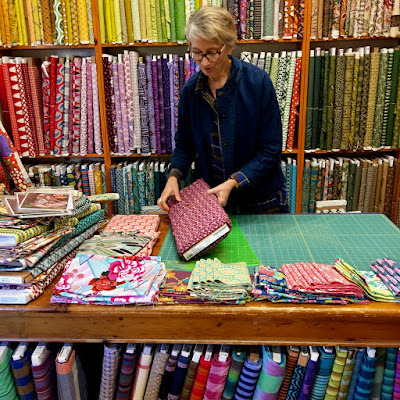 It would be amazing to have access to all of that Kaffe fabric in one place. how wonderful that you and Wendy are trading giveaways - I love that. It was meant to be. I'm so glad to see you teaching others the Pine Burr - keeping the tradition going. what bright and beautiful fabrics. Whiz Bang and cotton flowers. I grew up in Arizona...cotton growing all over the place.. In Arizona...the 3 C's Cotton, Copper and Cattle...should be 4...Cowboys too..
Beautiful quiits to start your day. 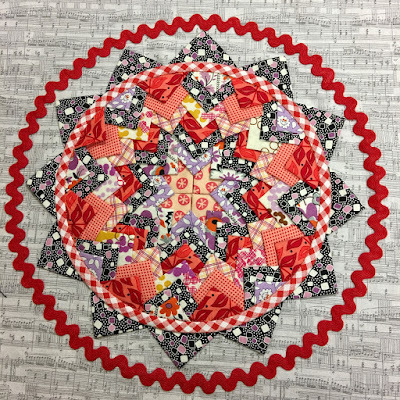 The ladies in your class made some gorgeous blocks. So neat when a fabric just grabs you! Enjoy! A lovely post to read Rachael. Just wish I lived in your country. Id be at that shop every week. Probably just as well I only get to visit once a year! Saves the bank balance! Your class looks fabulous! I always love seeing the Whiz Bang blocks--so fun! 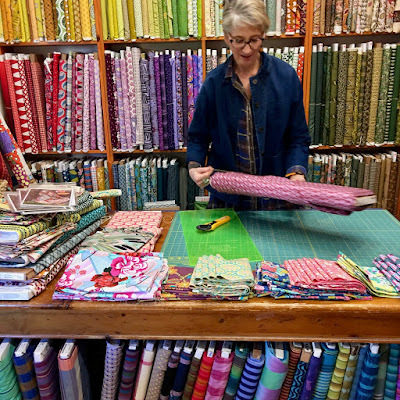 Kathy's shop looks so inspirational! I think Scrumptuliscious fits that wall of fabric perfectly! And, I quite agree that you can "taste the difference" of a hand picked (with love and care) kit. I don't buy a lot of kits because of my shameful two rooms full of fabric, but I would highly recommend ones put together by my favorite fabric shop. They are delicious. Yes I can see the glow of the quilt! 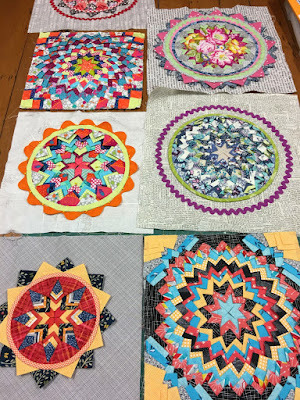 What fabulous blocks the gals have made and what a wonderful post! Gosh those Cotton Flowers are awesome! 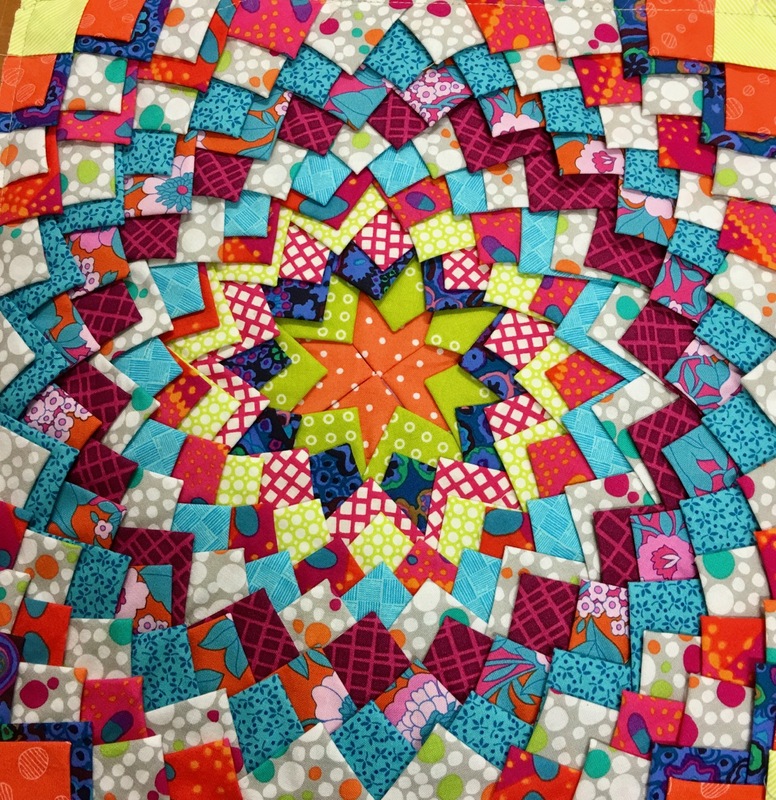 Wow -- look at all those beautiful blocks your students have made! 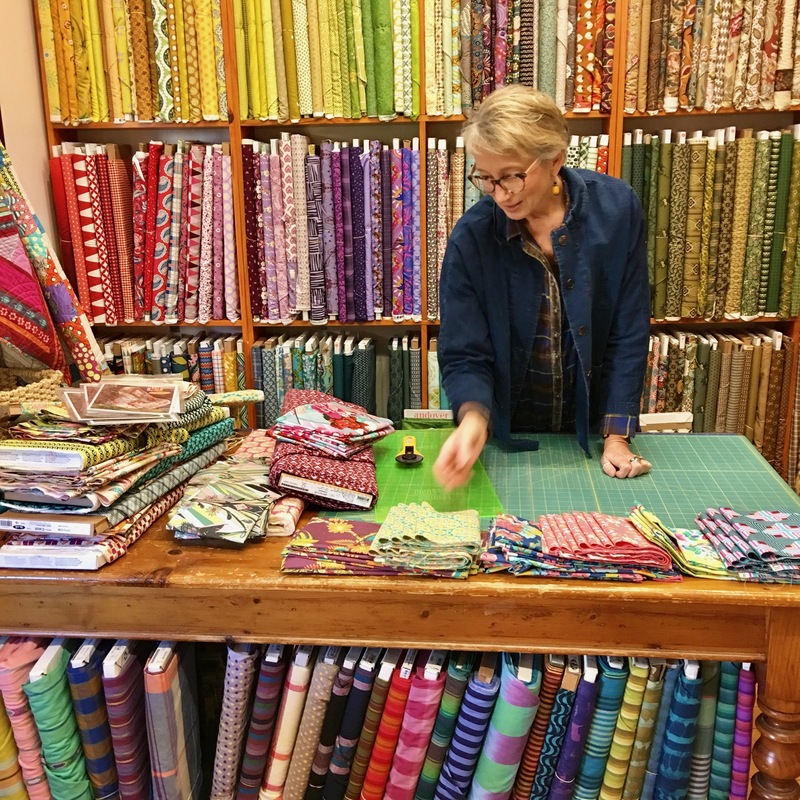 Kathy's shop looks so fun and wonderful -- I'll bet the whole place is full of glorious color. I'd love to see it. 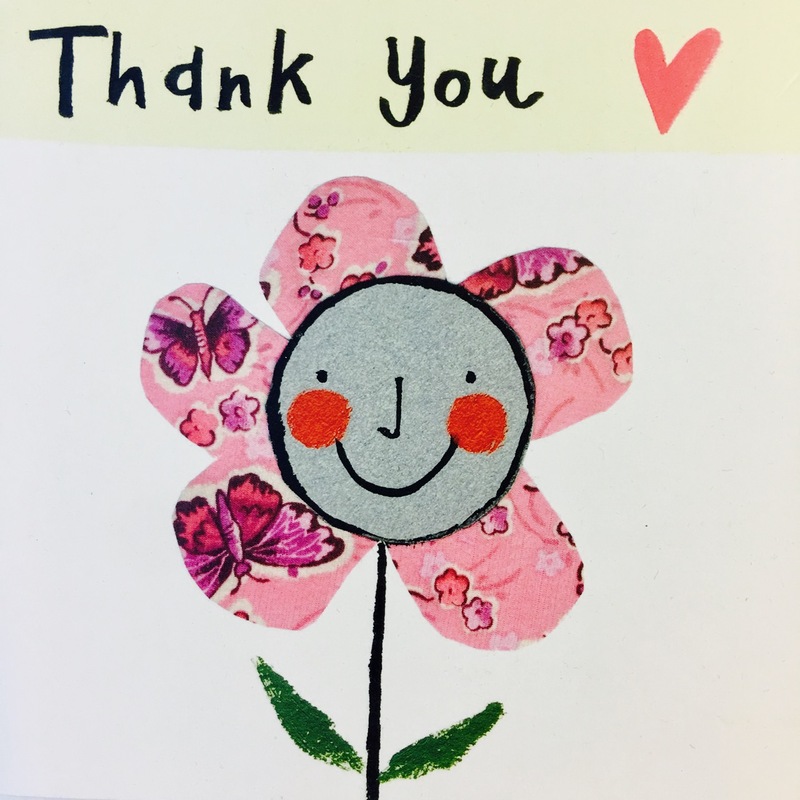 Thanks for sharing your pretty pictures! Your Class posts are always joyful. 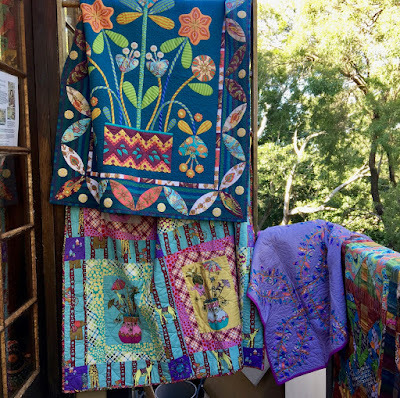 I haven't been to Kathy's but the photos of her shop encourage all the georgeous Wizz Bang Blocks Love the tiger and your humorous approach has always made me smile. That truly is a marvelous display at the entrance to material Obsession. What a lovely way to welcome customers. 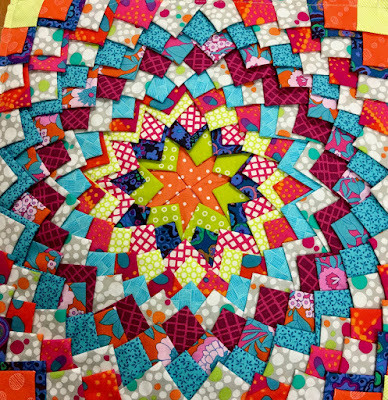 Your students are obvious making wonderful blocks under your guidance. Such fun to see them grow. The cotton is fascinating to see and what a great way to use it in a display. are you still in the mountains Rachel? Where is material obsessions? Un sacco di cose belle da vdere! Fun day for you and all the others who got to spend it with you! It is amazing to see how all the blocks go together, and that each one is so unique. So glad you get to do this work that seems so right for you. 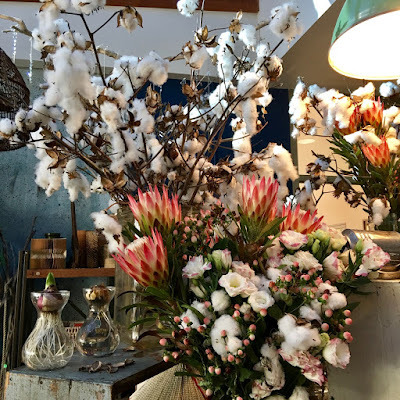 I have never seen a bouquet done with cotton flowers! It's beautiful!!! Love, love, love the wall of Kaffe Fasset! I think your word for it fits perfectly. All the goodies before your presentation looks yummy! And I love all the prjects. I need to learn that technique. There are so many ways it can be done to look wonderful! I Really like the fabrics you bought. So pretty, I also like color with a dark background, it makes the print stand out really nicely.